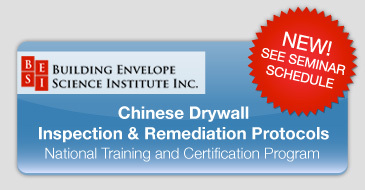 Chinese Drywall Testing, Environmental Testing - US Building Laboratories, Inc. US Building Laboratories was formed to provide solutions that are relevant to the construction and environmental industries. Working independently and in conjunction with other laboratories, US Building Laboratories provides environmental analysis; energy testing; ASTM testing of construction materials; chamber testing; Chinese Drywall testing; mock up testing for roofs, walls, doors, windows; forensic analysis; and scientific research & development. US Building Laboratories joined forces with AllerAir Industries and US Building Consultants to develop an advanced air filtration system for the reduction of Hydrogen Sulfide (H2S) that could offer temporary stabilization of homes with Chinese Drywall. Read about our Air Filtration Systems.